Modern style tackle bags for all kinds of game gear. These tackle bags work just as well with spinning and sea fishing tackle as with fly tackle. 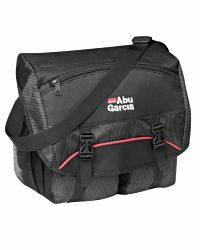 Made from a strong waterproof fabric, these black tackle bags have contrasting red piping. - Adjustable webbing shoulder straps with padded shoulder pad. - 'Premier' bag has full length zippable pocket in the flap. As described, yet to be used.